March 2018 Update: Now there’s a 4 door version of this car. 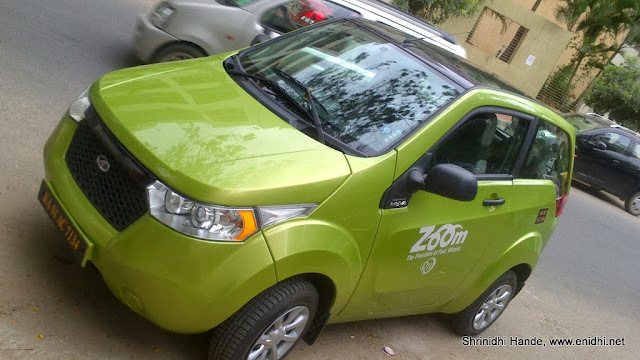 Zoomcar had them in its fleet in Mysuru but now seem to be discontinued, just when I thought I will book it to check it out. Sadly nothing much has changed on the infrastructure front. Check this post for my suggestion to Mahindra group to improve infrastructure and sales of e2o. I hadn’t driven an electric car before. Buying them didn’t make any sense and no body offered it on rent. Could have tried a test drive from showroom pretending to buy one, but test drive will not let me experience the vehicle fully and also I’ll have to deal with follow up calls from the sales guy later. However, with Zoom adding them to their fleet, at a rental of Rs 199 per hour, it was the perfect opportunity to take it for a spin. This post is part 1 or 2 and talks about looks, drive and space. In part 2, I will write about the practicalities of the car, charging and the economics involved. Before acquisition by Mahindra, Bangalore based Reva (maini group) used to sell in small numbers. The two seater tiny cars were relatively expensive and there was no infrastructure to charge them and nor there was any government support to promote their sales and usage. Nothing much has changed over last one decade. Indian cities still lack infrastructure support for electric cars and most governments don’t care. Earlier this year, Mahindra launched an improved version of Reva cars, now branded E2O (in sync with M&M’s obsession for names ending with O). The new E2O was launched first in Delhi where the car gets some subsidy from the government, hence its price is cheapest there (about 6 lakhs on road). But down south, in Bengaluru, Reva’s home state, the car costs close to 8 lakhs, as much as popular sedans and compact SUVs. At this price point, car completely loses its value proposition. Sales, as expected, continues to be dismal. Only those who have some spare money to show off their eco concerns are buying few. A regular middle class family planning to buy a Maruti or Hyundai car is not even considering E2O as a possible option. Probably in next 3 years, once petrol price touches Rs 300 a litre, mathematics will hopefully tilt in electric car’s favor. Coming back to the car, I spent 2 hours driving it around and exploring the car and below is what I found. My simple conclusion was that Mahindra Reva e2o is a nice fancy second car to buy with spare money and can't be one's primary mode of transportation. Compared to older one, new Reva certainly looks bigger, bolder and professional. From outside, Reva looks nice and inviting, not minuscule and dull like its predecessor. New Reva is fully grown car and feels at par with its peers. No one will give a 'oh-how-is-he-managing-in-that-smaller-than-auto-of-a-car' look. If Tata Nano, Reva and other small cars are to participate in Beauty contest, Reva is the most likely winner. The new E2O from Mahindra is a 4 seater with 2 doors. Second row is accessible by folding the first row seats and ingress/egress is convenient only for kids & teenagers. Fully grown adults will have to struggle their way in and out, though official seating capacity is 4 adults. 2nd row space was more that what we had expected. The rear door opens and there's tiny space to keep a few shopping bags. But loading that area with heavy bags is not advisable, as the battery and motor are below. Starting the car was tricky. One has to keep the key fob close to the start stop button and wait for the system to authenticate and get started. Range of the key fob could have been extended a bit, so that as long as it is within say 2 feet, it should work. But for now, one has to patiently hold it next to the push button and wait for several seconds. So, if you want to use this car as your escape car after robbing a bank, be sure to leave few minutes early. Once started, key fob can be kept away. As you know, Mahindra Reva e2O is an electric car with automatic transmission. It has a gear knob with 4 options: R for Reverse, N for Neutral, F for Front and B, which is Booster or high performance mode. Typically, automatic transmission levers marked D (Drive or go forward), N (Neutral), R (Reverse), S (Sports or performance mode) and P (Park). While P mode is missing in Reva, they've chosen to name D as F, S as B. There's no harm being unique or using different notations, but using industry standard conventions would make it easy for drivers who drive different car. Official description of 'B' mode, as per the owner's manual is 'When you want to overtake or have fun with your car'. Putting in B gives a boosted performance, at the cost of driving range and battery life. I drove the car for about 40-50 kms in 2 hours. In its normal F mode, it struggles to overtake an auto. Performance is better in B mode. It is like driving TVS XL Super among all two wheelers. If you have your expectations well set, then it is fine, but if you're going to drive this with expectation that it will outperform other cars in its price range, you'll be disappointed. It has power steering, but when the vehicle is not moving, power steering is almost non-responsive. It is not like hydraulic power steering in normal cars, which can be rotated at fingertips. So sharp turns during parking does need some manual effort. Otherwise steering is fairly supportive, better than the 2011 Nano I'd driven. (2013 Nano has some sort of assisted steering). Its small size makes it easy to drive and park. But the 100kms range on full charge limits its practicality. If you've living in Banashankari and have office in Whitefield, this car is not for you. Range drops further if you use AC/headlights or drive in B mode. Range will drop even more, once battery life starts deteriorating. That's it for this post. In the next part, I have written about economics of owning this electric car, battery and charging aspects, other features and possible improvements. Read part 2 here. excellent n nicely put. enjoyed reading the blog. Hi, for how many days did u use the car ? ?